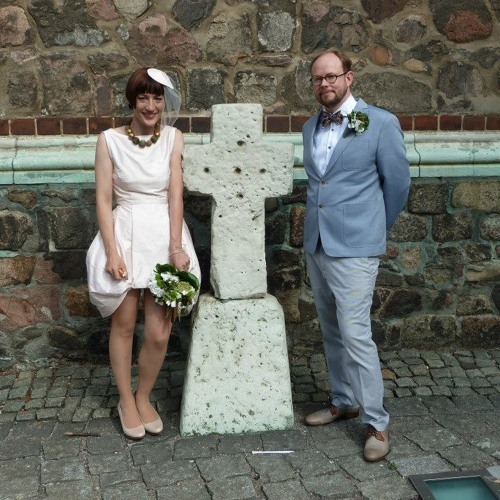 Here are three choral pieces from the wedding of Ben Houge (that's me) and Jutta Friedrichs, which took place in the Marienkirche (the second oldest church in Berlin), Alexanderplatz, Berlin, August 17, 2013. A fantastic choral quartet (Cassandra Hoffman, soprano; Saskia Klumpp, alto; Douglas Nasrawi, tenor; Jörg Gottschick, bass) performed these two works by me and one piece by American composer William Billings (1746-1800). I wrote "Was Ist Heilig" on commission from Emmanuel Church in Boston (already thinking ahead to this second European performance), and it was premiered there on July 28. Die Brautwerbung is was composed especially for the wedding. Nate Houge pressed record on the Zoom to capture these live recordings.